Two from two: Bennett on his way to winning yesterday. IRELAND’S LEADING MAN Sam Bennett’s bright start to the 2019 season continued today, as the 28-year-old sprinter made it two from two on the Tour of Turkey. 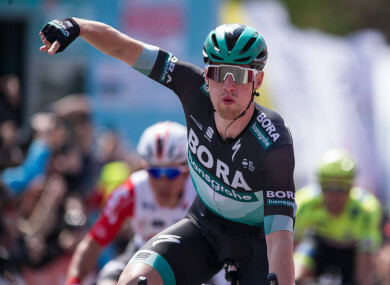 Bora-Hansgrobe rider Bennett doubled up on stage two after his opening win at the 55th Presidential Cycling Tour yesterday, clocking a time of 4:11.48 on this occasion. His Bora team-mate Felix Großschartner of Austria finished second while Colombia’s Jhonatan Restrepo was third. So far this year, Bennett won the final stage at the Vuelta a San Juan in Argentina, the final stage of the inaugural UAE Tour, and he recorded a further two wins at Paris-Nice last month. This comes as his sixth stage win of 2019. In 2018, he recorded three stage wins at the Giro d’Italia, three at the Tour of Turkey, and also won the Rund um Köln. Email “Dream double as Ireland's Sam Bennett powers to second successive win in Turkey”. Feedback on “Dream double as Ireland's Sam Bennett powers to second successive win in Turkey”.